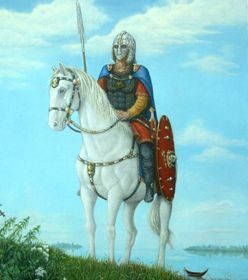 general and of Rædwald of East Anglia (died c.625) in particular. first king of a united kingdom of the English-speaking peoples. the establishment of Roman Christianity in England. 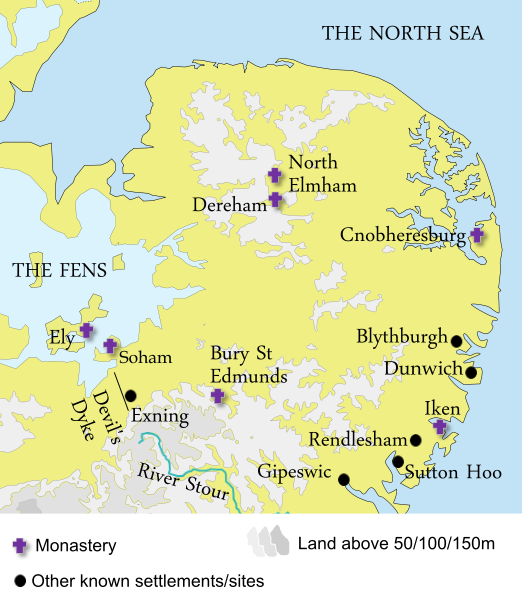 Events of the early years of Rædwald’s reign included the arrival of Augustine of Canterbury and his mission from Rome in 597, the conversions of Æthelberht of Kent and Saeberht of Essex and the establishment of new bishoprics in their kingdoms. Bede, when relating the conversion of Rædwald’s son Eorpwald in his Historia ecclesiastica gentis Anglorum, mentioned that Rædwald received the Christian sacraments in Kent. This happened in perhaps 604 or later, presumably at the invitation of Æthelberht, who may have been his baptismal sponsor. The date of his conversion is not known, but it will have occurred after the arrival in Kent of the Gregorian mission in 597:since it is claimed that Saint Augustine (who died in about 605) dedicated a church near Ely, it may have followed Saebert’s conversion fairly swiftly. Rædwald’s marriage to a member of the royal dynasty of Essex helped form a diplomatic alliance between the neighbouring kingdoms of East Anglia and Essex and his conversion in Kent would have affiliated him with Æthelberht, so bringing him directly into the sphere of Kent. In East Anglia, Rædwald’s conversion was not universally accepted by his household or his own queen. According to the historian Steven Plunkett, she and her pagan teachers persuaded him to default in part from his commitment to the Christian faith.As a result, he kept in the temple two altars, one being pagan and the second one dedicated to Christ. Bede, writing decades later, described how Ealdwulf of East Anglia, a grandson of Rædwald’s brother Eni, recalled seeing the temple when he was a boy. The temple was located at Rendlesham, the regio of the Wuffing dynasty, according to Plunkett. Barbara Yorke explains the dual nature of the temple by suggesting that Rædwald would not have been prepared to reject his old religion and fully embrace Christianity, because this act would have been a public acknowledgment of his inferiority to Æthelberht. Rædwald’s lack of commitment towards Christianity earned him the enmity of Bede as a renouncer of his faith. In 616 or 617, Rædwald assembled an army and marched north, accompanied by his son Rægenhere, and confronted Æthelfrith. He met him on the western boundary of the kingdom of Lindsey, on the east bank of the River Idle. The battle was fierce and was long commemorated in the saying, ‘The river Idle was foul with the blood of Englishmen’. During the fighting, Æthelfrith and Rægenhere were both slain. Edwin then succeeded Æthelfrith as the king of Northumbria and Æthelfrith’s sons were subsequently forced into exile. A separate account of the battle, given by Henry of Huntingdon, stated that Rædwald’s army was split into three formations, led by Rædwald, Rægenhere and Edwin. With more experienced fighters, Æthelfrith attacked in loose formation. At the sight of Rægenhere, perhaps thinking he was Edwin, Æthelfrith’s men cut their way through to him and slew him. After the death of his son, Rædwald furiously breached his lines and killed Æthelfrith amid a great slaughter of the Northumbrians. D.P. Kirby has argued that the battle was more than a clash between two kings over the treatment of an exiled nobleman, but was “part of a protracted struggle to determine the military and political leadership of the Anglian peoples” at that time. This is about the Anglo-Saxon ship burial under Mound One at Sutton Hoo, in Suffolk England. It was discovered in the summer of 1939 and is one of the richest finds in English archaeology. The excavation was begun by Basil Brown, a local, self-taught archaeologist, hired by Mrs Edith Pretty, the owner of Sutton Hoo, and was completed by a team of professional archaeologists. It is believed the grave might have been that of King Raedwald of the East Angles (reigned c. 599-624), who, according to the Venerable Bede, converted to Christianity, but also continued to worship the Anglo-Saxons’ traditional pagan deities. 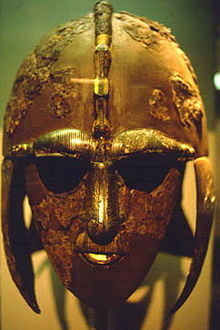 The Anglo-Saxons came to Britain in the fifth and sixth centuries from homelands in north-west Europe. This was after the collapse of Roman rule in Britain, and before the Viking invasions of c. 800-1035.